and we book year round for: Church events, bridal and baby showers, sprinkles, rehearsal dinners, intimate weddings, birthdays, anniversaries, graduations, communions, confirmations, retirements, and corporate meetings. 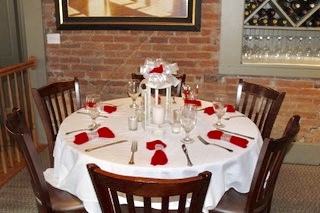 We offer customized menu options, exceptional service, and old world charm in a unique and quaint river town setting. Let us do the planning and help to make your special day easy! Thank you for helping us celebrate. As you can see from the family photo, we all had a wonderful time! The room, the service, and of course, the food were exceptional! You are the best! "It was a pleasure to work with Colleen & Chris! The atmosphere for our ceremony was warm and rustic and the farm-to-table menu with seasonal vegetables a delight. Everything went seamlessly and our guests were extremely impressed. We will recommend the Frenchtown Inn to our friends, family, and clients. They brought our Heaven to earth in Frenchtown, NJ."